It reminds me of America, one of the Shadows told Jerry Lordan when he played them his latest instrumental. America seems like a wonderful land, said somebody else, and the name stuck. A sweetly-struck six-note figure becomes a sweep of the arm taking in America’s open skies, its nobility, its glamour, its youth, its space – so much space! – and for the cramped Britain that kept the Shadows’ record at the top for six weeks, its exotic difference. On the 24th March, as the record reached No.1 in Britain, the young President of the Wonderful Land was in bed with its most beautiful, starriest star. According to Marilyn Monroe’s biographer, Donald Spoto, the night she spent with Kennedy in Palm Springs was the only verifiable time the pair were ‘intimate’. Their affair is one of history’s too-perfect, too-corny moments (even if, like most hopeless flings, its reality was sad and grubby) – two star-crossed icons! But icons of what? Of a sixties that didn’t end up happening. You can hear it in the two widescreen minutes of “Wonderful Land” – no tension, no division, simply optimism and energy, a promise that things would not only get better but get better smoothly. The Shadows never made an impression over here in the “Wonderful Land”–some sort of sorry irony there, no? And I’m sorry to say that for all my lifelong obsession with British pop, I’ve never taken much interest in Cliff or the Shadows; ergo, I’ve no comment about the song per se. But your historical contextualization of the recording is, well, WONDERFUL. How better to describe the delusions of glamour (as opposed to grandeur) that we so wanted to embrace on both sides of the Atlantic at that time! I was a mere child of eleven, but I clearly remember the enthusiasm that everyone–even my usually self-defeatist parents–experienced for that one brief shining moment. WE (i.e., Americans) never had it so good–or at least we had the blissful illusion. Interesting take, as I’ve always thought it sums up the wide eyed optimism of post-war Britain, people moving to the new towns ringing London, the space and light in the bright open spaces of Crawley and Stevenage (or the modernist sweep down to the water in reconstructed Plymouth, the Gerry Anderson-like underpass and flyover in Croydon). There is also a definite melancholy to the song, possibly in the melody and string arrangement’s huge sense of promise, and its awareness that the promise is too huge to ever be truly fulfilled – as a trip to Plymouth or Stevenage will swiftly confirm. – aha, yes, it works! Along with ‘Apache’ – the best Shadows # 1. Only 36% of people who have voted on Popular ’62 give this 6 or more, yet Wonderful Land has a 7.9 rating here. Is this the wildest difference between a year-end poll and a stand-alone Popular entry? Fair request from Erithian and I shall oblige. This is a fabulous little piece of music and I find myself in agreement with #4 who bracketed it with “Apache” as the cream of the Shads’ work. The American reference is interesting as WL does clearly resemble the theme to “The Big Country”, a truly magnificent score. Both pieces are bursting with optimism and one can understand how WL stayed so long at the top during a year which nearly saw the world destroying itself, Norma Jeane topping herself and just a year before Macmillan’s government imploded and the second of the star-crossed icons was made a monkey of in Dallas. 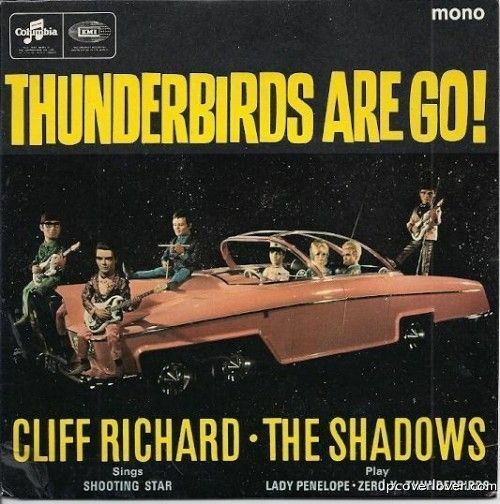 Talking of Thunderbirds, I’m pretty sure that Cliff and the Shads did indeed pop up on one of the episodes. I think they were supposed to be the sons of the originals. The virginal Tin Tin was suitably enthralled. An episode possibly also, but they famously appear — or their children do — in the film Thunderbirds Are Go!, playing at a kind of space nightclub, to which the even more virginal Alan squires Tin Tin (except sadly it’s all a dream). I think I prefer FBI and, especially, Man of Mystery to Wonderful Land and Apache but all 4 are very good. Whenever I hear them, I think someone could do a movie with the best Shadows early work as the whole soundtrack – I suspect it could come off really well. That remake of Brighton Rock that moved it to the 60s would have been a good one, for instance. Or has this idea already been done?